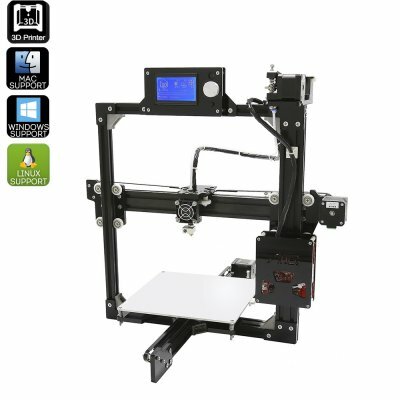 Successfully Added ANET A2 DIY 3D Printer Kit - High Precision, Metal Frame, Multiple Filaments, Windows + Mac and Linux Support to your Shopping Cart. With the ANET A2 DIY 3D Printer Kit you will be able to print anything you can imagine. Being a DIY Kit, this is the perfect 3D printer to enter the world of 3D printing in an affordable manner. Existing out of full metal parts this 3D printer is easy to assemble without the need for any prior technical knowledge. All components within this DIY kit can be easily attached to one another by following the easy to understand instructions. Featuring a printing volume of 220x220x220mm and printing precision of 0.01 to 0.04mm this 3D printer is capable of creating any figure imaginable with stunning precision. Its ultra-flat aluminum alloy printing surface further enhances its performance and significantly increase your overall user experience by delivering a smooth and high-quality end product. Thanks to the fact that this cheap 3D printer supports both STL and G-code data formats you are able to print one of the thousands of freely available designs and models that have previously been shared online by 3D printing fanatics. Offering a printing speed up to 100mm per second this 3D printer is capable of delivering highly precise and great results at lightning fast speeds. Holding a high-end print nozzle that can reach up to a maximum of 250 degrees centigrade, along with an adjustable heat plate temperature ranging from 50 to 100 degrees, the ANET A2 DIY 3D Printer allows you to use a wide range of printing mediums. Being able to work with PLA, ABS, Wood-Polymer, Nylon, Flexible PLA, and PVA filament this 3D printer allows you to use the right printing material for whatever project you’re working on. Being compatible with Windows XP, Vista, Win7, Win8, Win10, Linux, and MAC this magnificent DIY 3D printer kit supports all the major Operating Systems out there. Offering great online support and allowing you to import customizable 3D models, this printer allows you to print any object imaginable in a quick and easy manner. The perfect tool for designers, hobbyists, artists, and classrooms, this DIY 3D printing kit offers a great and affordable way to get introduced into the world of 3D printing. Instead of buying an expensive pre-assembled 3D printer this DIY kit provides the added enjoyment and achievement of assembling a state of the art electronic device yourself. Whether it is used for entertainment, business, or education, this DIY 3D printer kit offers a great way for creative minds to get involved in the creative and unlimited world of 3D printing. This DIY 3D Printer Kit comes with a 12 months warranty, brought to you by the leader in electronic devices as well as wholesale electronic gadgets..
Arabic: - دقة الطابعة ثلاثية الأبعاد - Chinese Simplified: - 精密的 3D 打印机 - Czech: - Přesné 3D tiskárna - Dutch: - Precisie 3D-Printer - French: - Imprimante 3D Precision - German: - Präzisions-3D-Drucker - Hebrew: - דיוק במדפסת תלת-ממד - Hindi: - प्रेसिजन 3 डी प्रिंटर - Italian: - Stampante 3D di precisione - Japanese: - 高精度 3 D プリンター - Korean: - 정밀 3 차원 프린터 - Norwegian Bokmål: - Precision 3D-skriver - Romanian: - Precizie imprimanta 3D - Russian: - Высокоточные 3D-принтер - Spanish: - Impresora 3D de precisión - Thai: - เครื่องพิมพ์ 3D ที่แม่นยำ - Turkish: - Hassas 3D printerlere harcama maddeler - Vietnamese: - Máy in 3D độ chính xác cao.